It’s all things Cinderella this week with the release of the Cinderella Diamond Edition Blu-Ray, as well as the launch of the Cinderella Collection by Sephora! In keeping with the theme of Disney’s one-slippered princess, this week’s Stunning Style features Cinderella outfit. This top is one of Disney Couture’s earlier items. I can’t find it online anywhere, but it still might turn up on eBay if you keep an eye out for it. If you’re looking for stylish Disney princesses themed tops, Disney Vault 28 in Downtown Disney is the source, otherwise you’ll need to scour the internet. To dress up the look, I layered the top with a black cardigan I had in my closet. Layering is a great way to dress up a casual looking outfit. If I wanted this look to be casual, I wouldn’t layer the top, and I’d wear a pair of jeans. Instead I opted to wear a basic pair of black leggings. If you’ve been following our Stunning Styles, you know I’m quite fond of leggings! They’re a fun and simple way to change up a look and are a great alternative to jeans. I definitely had a fairy godmother looking over me when I found these shoes. I’d always been after a pair of plain, clear plastic/vinyl shoes that resembled Cinderella’s glass slippers, but many clear shoes have open toes, open heels, crazy high heels, and/or have crystals or other doodads on them. These shoes are by Stuart Weitzman and were a lucky score on eBay. If you’re after a pair of shoes like this, it’s definitely possible, you just need to be vigilant in checking sites like eBay and Etsy until you finally find what you’re looking for. I’ve been in love with pretty much all the Disney Couture jewelry by Kidada. When I saw the pave key necklace, I knew I had to have it! I love this key because key necklaces are, or were, a current fashionable item to wear (Tiffany keys especially! ), and it’s a great reminder of when Gus and Jaq are trying to get the key from Lady Tremaine in order to save their friend Cinderella. 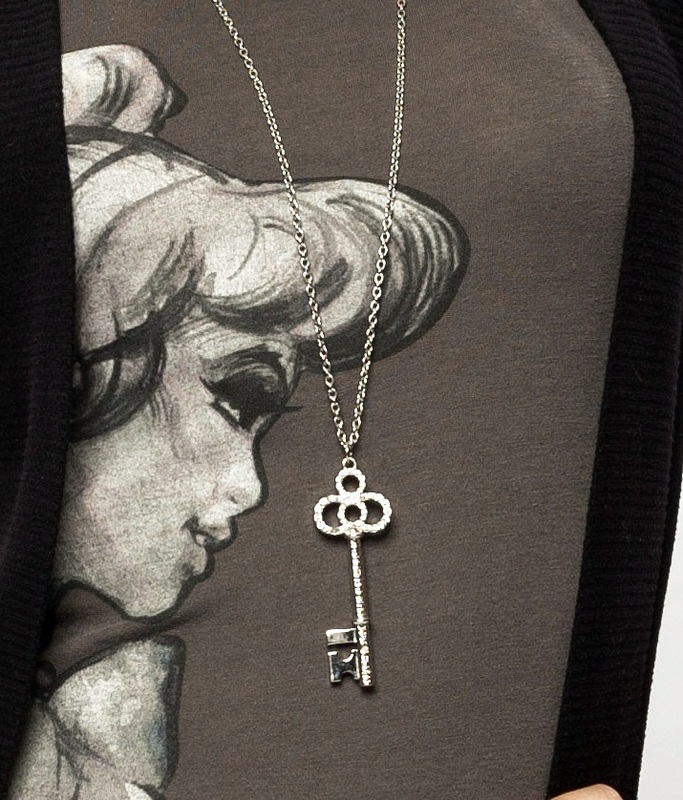 Luckily, this key necklace is currently available at DisneyStore.com. The earrings are a purchase from Disneyland from one of the stores in the park. I liked how simple they were and I had wanted an extra little something to add to this outfit. Disney has been making great strides in the last few years when it comes to fashionable clothing and jewelry. I first started to notice it with their jewelry and, at the time, was the new Disney Couture line by Kidada. 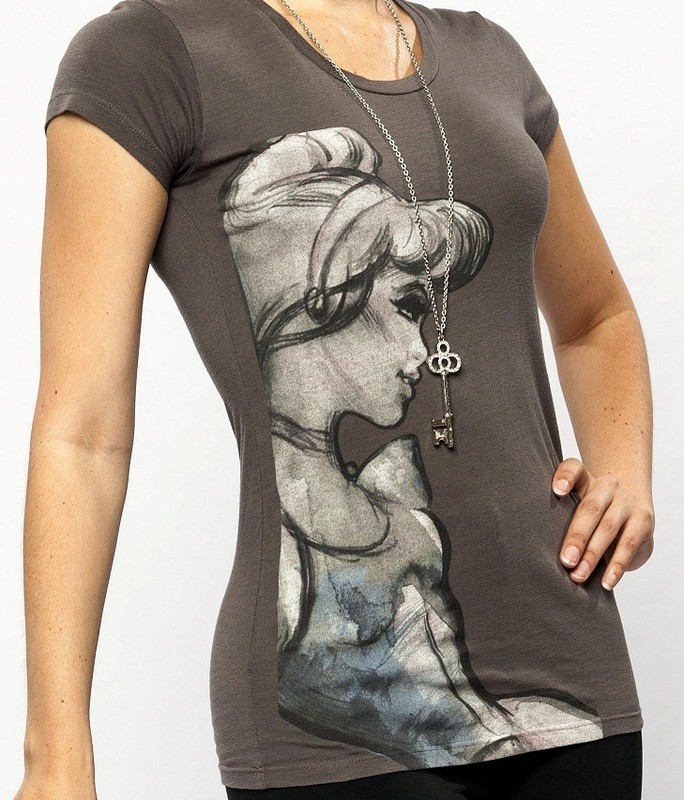 The clothing brand launched after the book The Art of the Disney Princess came out and used art from the book on their tops, setting their brand apart by using non-traditional images of the princesses. Now if you go to the parks, most of the regular Disneyland and Disney World brand clothing is quite stylish! To the point where I would sometimes mistake it for part of their Disney Couture line. Unfortunately the one failing point with both the Disney couture jewelry and its clothing is the lack of accessibility. The website barely has anything, and unless you are local to Southern California or Orlando, Florida, you’re going to completely miss out on some amazing tops. The Kidada Disney Couture jewelry is a nightmare to find, even the parks barely carry anything. So you’ll need to scour Google, and especially eBay to find most of the jewelry you want from that line. AllDisneyCouture.com shows you other places you can look as well. If you are fortunate enough to live in Southern California or Orlando, Florida, I highly recommend you drop by Downtown Disney if you don’t go there too often. It is really a must and Downtown Disney is an open area to the public, so you don’t have to worry about not having an annual pass! Disney Vault 28 is the store that carries any new Disney Couture related tops and other items. D Street is the other store that is a must to check out. They used to carry most of the Disney Couture tops at that store, as opposed to Disney Vault 28, but now D Street is mainly focused on carrying Tokidoki, Tokidoki Marvel, and Star Wars and other related tops and merchandise. We’d love to see what outfits you’ve come up with and what inspired you to put together the ensemble. Feel free to contact us through our blog, or on our Facebook Page. And don’t forget, we’re also on Twitter, and now on Instagram (username: settostunning)!